KindHeart offers a realistic and reproducible human cardiac surgery experience for deliberate practice of CABG, AVR, and Adverse Events. The Cardiac Surgery Simulator (CSS) is used with the Cardiac Tissue Cassette to enable simulation of cardiac surgery. The cassette is mounted in a KindHeart Cardiac Patient which simulates a human patient from neck to mid-thigh in a recumbent position. The Thoracic Surgery Simulator (TSS) is used with the KindHeart Thoracic Patient and KindHeart Thoracic Tissue Cassette to enable simulation of thoracic surgery on a human patient. The cassette is inserted into a KindHeart Thoracic Patient which simulates a human patient from shoulder to hip in a left lateral position. Surgery can be performed using open, laparoscopic, or robotic techniques. KindHeart offers a realistic and reproducible human surgical experience within an insufflated patient abdomen for deliberate practice. The Colorectal and Hernia Tissue Cassettes are used with the Abdominal Surgery Simulator. The cassette is used with a KindHeart Abdominal Patient which simulates a human patient from chest to mid-thigh in a supine position. Surgery can be performed using laparoscopic or robotic techniques. This is exciting. You will hear from us soon! 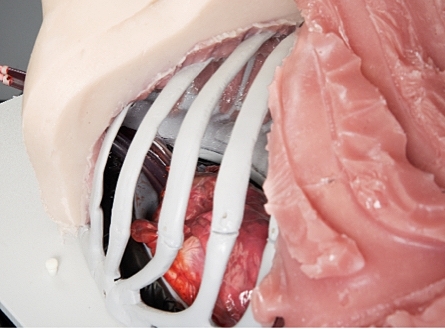 KindHeart simulation platforms are adaptable to actualize many specific surgical procedures. The KindHeart Promise is to support deliberate practice by placing real tissue at the focal point of simulation in a human form factor with realistic motion and perfusion. Call us with any specific requests you may have at 919-267-2122 or email us at sales@kindheart.com.